An on-track incident ruined a promising run at Road America for No. 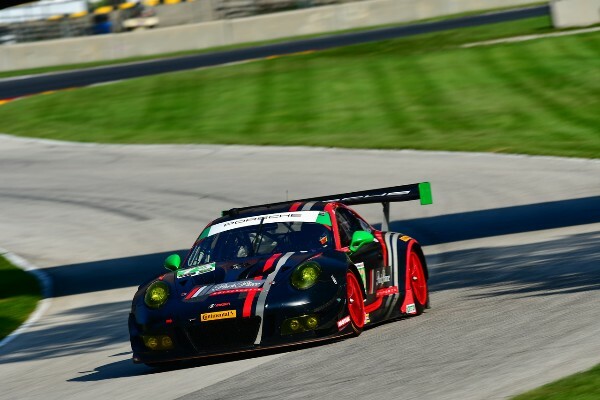 73 Park Place Motorsports Porsche GT3 R.
Patrick Lindsey was holding steady in second place at Road America when a Mazda Prototype divebombed the No. 73 Porsche and sent Lindsey off into a wall. Between Turn 10 and Turn 11 at Road America is the beloved Kink. A turn where close racing can easily cause an issue, and that’s precisely Park Place Motorsports story today. As the Mazda competed in a battle of its own, the prototype passed Lindsey in the Kink pushing him wide and leaving him no room to turn. With no space for correction, Lindsey was sent off into the concrete wall as little runoff lays to either side of the track. The No. 73 Porsche was unable to continue as the damage was severe. With under one hour of racing remaining, the crew did not have time to review and mend the damage. Lindsey was checked by medical and cleared. Currently, the No. 73 Porsche GT3 R is next set to run in the GT Daytona class at Road Atlanta for the 2018 season closer of the IMSA WeatherTech SportsCar Championship. That lineup has yet to be confirmed as both Bergmeister and Lindsey will be competing at Fuji Speedway in the World Endurance Championship Super Season.